Bob Glazer, founder & CEO of award-winning global performance marketing agency Acceleration Partners, offers radical --yet proven-- ideas for creating a positive company culture. 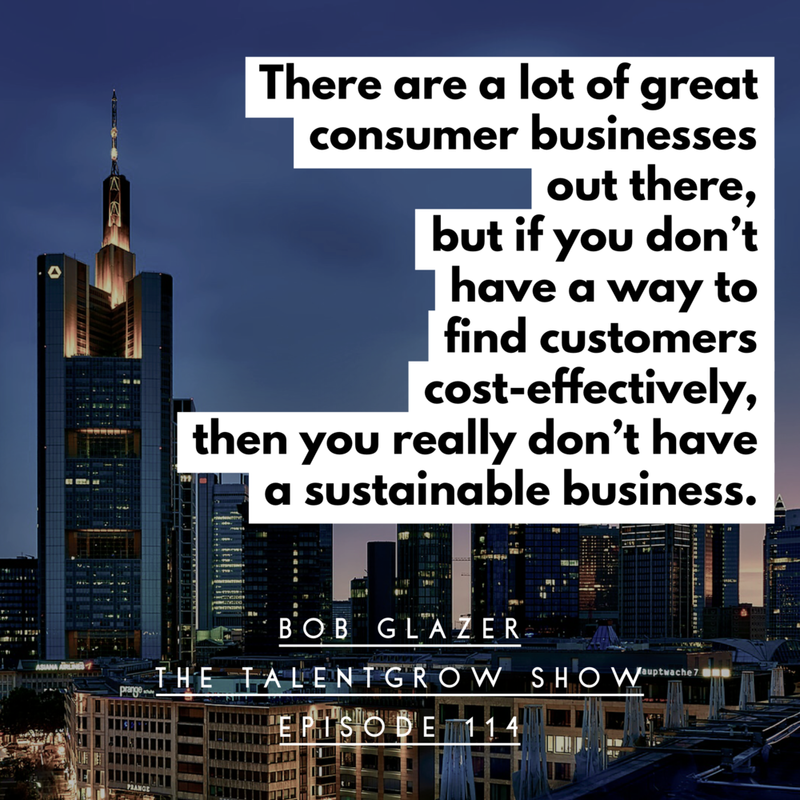 On this episode of The TalentGrow Show, Bob also exposes old practices and paradigms that need to go away – like the two-week notice system (what?!) and talks about how to implement a positive transition plan and why being consistent about your core values is more important than you think. Find out how his company won such culture awards as #4 on Glassdoor’s Employees’ Choice Awards, Entrepreneur’s Top Company Culture, and Inc. Magazine’s Best Place to Work among others! Don’t miss this value-packed episode and share it with others! Robert Glazer is the founder and CEO of global performance marketing agency, Acceleration Partners. He is also the co-founder and Chairman of BrandCycle. In addition to being a serial entrepreneur, Robert has a passion for helping individuals and organization build their capacity to outperform. Under his leadership, Acceleration Partners has received numerous company culture awards, including #4 on Glassdoor’s Employees’ Choice Awards, Ad Age’s Best Place to Work, Entrepreneur’s Top Company Culture, Inc. Magazine’s Best Place to Work, Great Place to Work & Fortune’s Best Small & Medium Workplaces and Boston Globe’s Top Workplaces. A past recipient of the Boston Business Journal “40 under 40” award, Bob recently authored the international bestselling book, Performance Partnerships: The Checkered Past, Shifting Present, and Exciting Future of Affiliate Marketing. TEASER CLIP: Bob: We’re in client services. We’re trying to build a high-performance firm. Three to four years ago, we got people giving two weeks notice, we think we have a good culture and we’re just like, “This seems like a broken paradigm that people lie, interview, don’t feel like they can discuss these things and then we find out that they give two weeks notice. It’s terrible for our clients.” How can we break this paradigm? This seems like a practice from the command and control era that no one has found a better way. The analogy that I like to use, and, our culture head and I are currently writing a book on mindful transition and we’re almost done with it, but our analogy is, can you imagine being in a relationship and the person says to you, “Hey, can you talk for a minute?” “Sure, what’s up?” “Well, I’m moving. I have a new boyfriend and I’m moving into his house in two weeks.” And you say, “You never even told me you were unhappy!” We would think this is absurd in a relationship, but this goes on everyday. [MUSIC] Announcer: Welcome to the TalentGrow Show, where you can get actionable results-oriented insight and advice on how to take your leadership, communication and people skills to the next level and become the kind of leader people want to follow. And now, your host and leadership development strategist, Halelly Azulay. Halelly: Hey TalentGrowers. Welcome back to another episode of the TalentGrow Show. I’m Halelly Azulay, your leadership development strategist here at TalentGrow. Let’s be real. A lot of times, when people teach how to be a leader, how to create company culture, they don’t necessarily have the experience of having done it. Some people who have the experience of building are not necessarily really great at breaking it down and teaching others how to emulate and replicate their success. This week we’re lucky to have somebody who is both. We have Bob Glazer, and he has built successful companies and he is good at sharing what makes them successful. We’re going to dig into the importance of culture and creating the right kind of culture. He has had a kind of culture that's created tons and tons of best place to work awards, including from Glassdoor, which is the list where the employees anonymously rank the company. You can’t rig that one! He breaks it down. We also talk about how to know if somebody is not going to work out and most controversially, Bob suggests you stop having a two-week notice policy. He describes what to do instead. 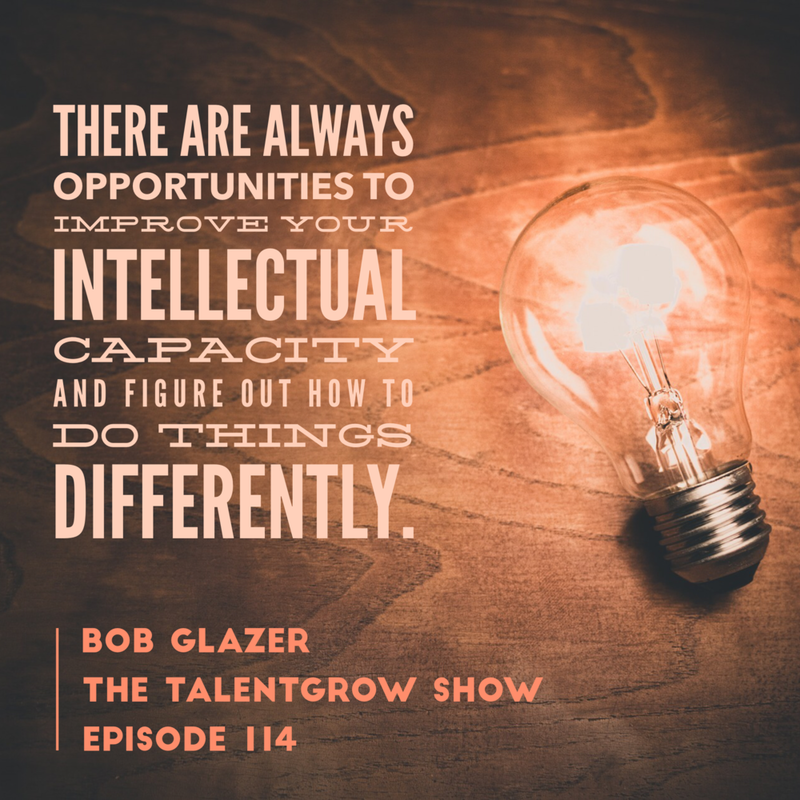 So I hope you’ll enjoy this episode of the TalentGrow Show with Bob Glazer. Here we go. All right, TalentGrowers. We have Robert Glazer, also known as Bob. He’s the Founder and CEO of Global Performance Marketing Agency, Acceleration Partners. He’s also the co-founder and chairman of Brand Cycle. In addition to being a serial entrepreneur, Robert has a passion for helping individuals and organizations build their capacity to outperform. Under his leadership, Acceleration Partners has received numerous company culture awards including number four on Glassdoor’s Employees’ Choice Awards. We’re going to talk more about that. Glassdoor’s Employees’ Choice Awards, Ad Age’s Best Place to Work, Entrepreneur’s Top Company Culture, Inc. Magazine’s Best Place to Work, Great Place to Work & Fortune’s Best Small & Medium Workplaces and Boston Globe’s Top Workplaces. And I’m sure as we speak, they’re racking up more of these awards. He’s a past recipient of Boston Business Journal’s 40 under 40 award and he recently authored the international bestselling book Performance Partnerships: the Checkered Past, Shifting Present and Exciting Future of Affiliate Marketing. Bob, welcome to the TalentGrow Show. Bob: Thanks Halelly. Excited to be here. Halelly: I’m really glad that you’re here, and listeners, as you could tell from all of those awards, I was like, “We want to find out what makes a company culture the kind of company culture that gets all of these awards.” Before we go there, I always ask my guests to describe their professional journey briefly. Where did you start and how did you get to where you are today? Bob: I started, I guess going downward in size of organizations, but after school, I started in strategy consulting, kind of I graduated right in the dot-com. Halelly: What did you study? Bob: I studied business. I actually created an independent major that was half business and half organizational psychology. I think I had an inkling that I wanted to work with small businesses, and I can tell you the psychology stuff gets used a lot more than some of the business fundamentals. I went on to work in a venture capital fund and really was always focused on growth and settled into business and kind of the customer acquisition side, which was where I really liked to operate under the premise that I think there are a lot of great consumer businesses out there, but if you don’t have a way to find customers cost-effectively, then you really don’t have a sustainable business. Halelly: Right. So you went into the venture capital, then you went to customer acquisition. Continue! Bob: Then I went and operated in a business for three or four years, worked with the founders and grew that business, and really decided I was increasingly becoming unemployable and helping other people grow their business, while working in the business, didn’t feel very rewarding. I ended up leaving and starting two businesses at the time. One was sort of in the affiliate marketing space and one was Acceleration Partners. Even though we were doing a little more different stuff at that time, really made my own business helping other people grow their businesses. Halelly: And on the side, you started a newsletter? Bob: Yeah, so three years ago I started just sending a note every Friday. As I worked on my morning routine and tried to get more intentional, called Friday Inspiration, and I sent it to the 40 or 50 people who were on my team every Friday and it was a quote and a story or something I had found that I really liked. I pulled it together and it was even helpful for me. I really didn’t think anyone was reading these things or I didn’t know if they were paying attention. I would start getting emails back saying, “I really love these. I look forward to every Friday. I send it to my mom, my sister, my husband forwarded it to his company,” and I started talking to a few other COOs about it and said, “You know, I’ve been doing this and getting really great feedback. I’ll send you mine, and you can forward it along or try it.” I was literally bcc’ing people at the time. A few more people asked me about it and I decided to start a newsletter. I kept it in a plain format, just couldn’t manage the emails, and then it just started getting forwarded around. I set up a website to put the old ones on that people were asking about. Three years later, it’s about 40,000 people around the world and in I think 50 countries each week that get Friday Forward. It’s ended up turning into a sort of Genesis for my second book. Halelly: It’s amazing. One of the things listeners know is I love to hear stories about people who are building something in addition to their main job, the focus of their job. Your job was not focused on writing a book or writing a newsletter. It was something you did kind of as a passion project, and now you’re doing two tracks at the same time, right? You’re speaking a podcast, at conferences, but you’re also running businesses. Halelly: Very cool. All right, so now we’re going to go to where I know people are just clamoring to hear. Glassdoor, I guess maybe some listeners might not know, but Glassdoor is – this is my interpretation of it, maybe I’m wrong too – it’s a website where employees anonymously rank their current or past employers, and give reviews, to help other people. If I’m looking for a job, I can look in there to kind of get the dirt, the real story about this organization and what it’s like to work there. For you to have a high ranking and to place number four on Glassdoor’s employee choice awards means that people that work for you currently and in the past say this is a place to work. How do you get such a reputation? What are some of the secrets that you can share with us on how you’ve built such a culture? Bob: Yeah, and let me start by saying that you can make some different cases about what a good culture or a bad culture is. I think there are some objective things where you could say this is really bad, and this is really good, but my definition of a good culture is just one that is consistent between what it thinks, what it says and how people act. I think the frustration and dissatisfaction that most people have in companies is that inconsistency with what is on the wall, with how the leaders act and all that. What we have done is just clearly identify what is important to us. Where we’re going as a business, what our values are. We’ve found people who believe in that, and then that is exactly how people are expected to act. It’s how they’re hired, how they’re promoted, how they’re managed out if they’re not working. Our core values are used literally daily. They’re used in our awards, all that stuff. It’s just really consistent. If you’re a type of person that signs up for what we have on the wall or what we market, you’re going to come in and that’s exactly what the company values. Now, you may realize when you get here that you like those values, but they’re not you and it might not work for you, but I think that’s different than someone saying, “God, those guys were full of bleep. They said one thing, it was on the wall, these core values, no one acted like that.” I like to include the [inaudible 00:10:01] line on Enron, their values were trust, integrity and respect, and that’s just not how you got promoted at Enron. So I think what we’re really focused on, it’s a like of Patrick Lencioni around consistency and clarity is that we do what we say and we say what we do. I don’t believe it’s for everyone. We have some very specific things. We have a remote workforce, people work from home. It’s definitely not for everyone, but it is a great culture for the right people and the people that have opted in and self identified for that. Halelly: It sounds like this is the definition of integrity, right? Doing what you said you’ll do. Bob: Yeah, and I’ll tell you, because I do the onboarding – this is how much importance – I do the cultural onboarding for every new employee within their first two weeks of work. We go through an hour thing together in some small groups, and I ask them about past companies and how it’s different or the same. You are better off not having core values … you have a culture by fault or by design. You’re better off not having core values than having these things on the wall that no one ever talks about or does anything with, in terms of talking to employees that have come here and said they just don’t trust management or leadership when the stuff is painted everywhere and literally no one behaves or acts in that way. Halelly: It kind of just smacks you in the face, the duplicity of it is spelled out. Bob: It’s worse than not having anything. I really believe that. Core values can either be a joke or they can really be things that you say, “Look, if I wasn’t around and you had an emergency, one of our three core values should be the answer to whatever your problem needs solved.” Those are real core values. Halelly: It sounds, definitely, like you’re spending time, enculturating people into the organization and teaching them about the values. Do you also give them examples of how to enact them? Bob: Yeah, we talk about them a lot. One of the things we do on our bi-weekly, all company call is that people send in examples. We have a kind of core value shout out section. Sara demonstrated excel and improvement this week when she did X, or Melissa demonstrated embracing relationships and people send us the story. So we’re always highlighting it, but half, maybe three-quarters of the battle is that we find people that have these values. It’s a big part of our interview process, it’s really focused on aptitude and focused on values. I think you can always get better around our values, and we give people examples – here’s how you could be better at embracing relationships, or here’s how you could have owned this better. But fundamentally they have to be that type of person or not be that type of person. I was just coaching a nonprofit that I work with yesterday that’s sort of struggling to sort out core values, and I think a lot of people confuse external and internal. My definition of core values is the DNA makeup of a successful person at the organization. It’s not what we sent the client. It’s not a product or service. I think it’s very hard to mix those things. They tend to be different things. Because we consider those the DNA of the person who is successful at Acceleration Partners, a bit part of our interview process is testing for those values. Halelly: You said there are really three reasons why somebody is not going to work out at your company, and you say the first two are pretty black and white. Tell us, what are those three things? It sounds like you’re describing one of them, and how can leaders make better decisions about fit when they’re struggling with this? Bob: I think there’s three reasons that people wont’ work out at any company. One of the things that we’re really big on and I know we’ll get into this a little bit later, is there’s always going to be problems. I think a lot of companies treat the symptoms of problems, and say, “Oh, this person is not working,” and we get into the why part of it. We have decision trees so that we can really make kind of clear decisions to understand what we’re dealing with. When I say that, I think you might have issues that are derivations of that, but it comes down to three things. The first is, the person is just not a fit for your company. They are not the right person. They are not the right attitude. No matter anything about the job irrespective. They’re a bad culture fit and you should exit that person. The second case where you’re having an issue is when the person completely understands what is expected of them, and just can’t meet it. They can’t meet the performance goals and they know they’re not meeting it. I’ll give you two examples. Let’s say from our world, in sales, a person was hired, they knew that the quota was a million dollars for the year, and they put up $400,000 their first years and $400,000 the second year. It’s just pretty black and white, they can’t do what they know they should do, and they say, “I get the quota. I just can’t make it.” Client service, it could be their job is about retaining and client is happy, and that person has had 50 percent of their clients turn over over the two years. That becomes a really clear performance discussion around you know what we need done. The problem for most companies, and this does get to number one too if they’re not clear about their core values, if you’re super clear about your core values and someone doesn’t fit it, they will actually opt out 90 percent of the time before you start a discussion with them. That’s all set. The third bucket is, you aren’t clear. So no one – and I see this a lot – someone hires a sales and marketing person, and the people in marketing thought they were going to market, and the people in sales … so they actually think they’re doing the right things and people in the company think they’re doing the wrong things, and these are the ones where all this ambiguity gets in the way and everyone is frustrated because the person thinks they’re doing a great job, other people don’t think they’re doing a great job, because the objective metrics have not been set. I really think the goal is for companies – and those are messy, that third bucket – is to be clear enough to get everything into the first or second bucket. Look, the person is not the right person or the performance doesn’t work, but we’ve been super clear about expectations. So when we post a job, a job has the five core responsibilities that will be on the person’s basically performance review, and it has a list of KPIs at six months and a list of KPIs at 12 months, and so we tell people when we’re sitting down at six and 12 months, whether you’re successful or not, these are the metrics, the outcomes, so there’s no one deciding after the fact, “Oh, we thought they were doing more sales. We thought they were doing more marketing.” And that just really eliminates a lot of that third bucket so that we’re really talking about objective measures of performance and not totally different expectations between the employee and the employer. Halelly: Which makes it, a lot of times people complain and feel like they’ve been treated unfairly, because it seems like it’s subjective, like you’re applying some metrics to me after the fact, never having told me about them or told me something else. Bob: Exactly. We use a five-five-five system. Comes from the Entrepreneurial Operating System in the book Traction. So when you have your first check-in, it will literally go something like this: We’ll say, “Hey, Brad, we’re going to go over how you did in the company’s core values in the last quarter. We’re going to rank you against core values. How you did on the three or four things you committed in the beginning of the quarter to get done, and how are you on the five core responsibilities? Just stuff that you would have seen on your job description in terms of the KPIs?” That all was known, you know the score, are you living the values, did you do what you said you were going to do 90 days ago, we really operate on a quarterly rhythm, and did you hit those metrics that we had basically put on the job spec, before you came here, that we said we were going to look at at six months. So by removing those surprises, a lot of these things take care of themselves. People don’t want, like you said, the distrust is when it’s kind of a moving target. People don't want to do a poor job. If they sense they’re not a fit for core values, or a salesperson who knows they have a quota of a million dollars – so easy in sales, we’re trying to bring this clarity to other roles – but they know that they have a quota of a million dollars and they’re on track for $400,000, that sales person probably is looking for a new job. And before you even have to have a discussion with them. Halelly: It does really help. The more clear and objective you can make the goals, and the strategies, the more that people can track how they’re doing. You mentioned quarterly, and that you have a quarterly focus and that you do the five-five-five quarterly. Do your managers and leaders have other conversations about performance along the way, before the quarterly? Or is that the first time they’re talking about it? Bob: Part of our core value of excel and improve is that improvement is really about feedback. So we have a very real-time live culture feedback. We actually encourage people not to sit on feedback. Feedback, at the quarterly, should not be, “I’m saving a grievance of something you did 60 days ago.” The check-in section is sort of a general, recalibrating, how are we doing, let’s look at this. The feedback should be given in real time and everyone and all the leaders have read Kim Scott’s Radical Candor, and really focused on delivering outcome-based feedback in real time. If you don’t know how to give or take feedback, you won’t do very well at our company. Halelly: Awesome. So you guide people to give, in real time, the feedback, and you give them the tools with a book, you said, and then the expectation is that the quarterly meetings are really just a summary? Halelly: Exactly. It’s one of the things I harp on a lot in my talks and workshops, so I’m glad to hear we’re in alignment. You also had a really interesting blog I read. You wrote about how to put an end to the two weeks notice practice. You say that there is something better, that you call open transitions, where employees and employers become partners in finding the best possible solution, creating a healthier work environment, reducing anxiety and allowing for effective planning, so that both parties can seize new opportunities. This was me quoting from you. Your company, you’re calling that Mindful Transition Program. Tell us about that. Bob: We’re in client services. We’re trying to build a high-performance firm. Three to four years ago, we got people giving two weeks notice, we think we have a good culture and we’re just like, “This seems like a broken paradigm that people lie, interview, don’t feel like they can discuss these things and then we find out that they give two weeks notice. It’s terrible for our clients.” How can we break this paradigm? This seems like a practice from the command and control era that no one has found a better way. The analogy that I like to use, and my culture head and I are currently writing a book on mindful transition and we’re almost done with it, but our analogy is, can you imagine being in a relationship and the person says to you, “Hey, can you talk for a minute?” “Sure, what’s up?” “Well, I’m moving. I have a new boyfriend and I’m moving into his house in two weeks.” And you say, “You never even told me you were unhappy!” We would think this is absurd in a relationship, but this goes on everyday. It took us a while. People didn’t believe us. We said we were really going to change it. We want to change the paradigm. If you’re not happy, tell us. And likewise, if we’re seeing problems, we’re going to tell you. If you come to us and you talk about a problem or we get down to the root, we look at anything that’s not working as a chance to kind of dig a little deeper and say, “What’s going on here? Is this a fixable problem? An unfixable problem? How do we address this before you’re interviewing?” Because by the time you’re interviewing, we’ve lost you. We said, “Look, we will never walk you to the door if you come and have these discussions.” And these go both ways. People come to us and start them, and we’ve started them with people. We will let people work here for two to three months – we know they’re leaving, we know they’re interviewing. They’re on sort of a transition plan, and we’ve done this openly. People don’t even know who is who. We treat everyone the same, respectfully. We’ve found great jobs for other people. Sometimes it’s like, “Hey, the job you want we don’t have. But why don’t you start looking. We’ll use our rolodex.” One person on our team, we knew what he wanted to do through discussions and we knew we just didn’t have the right role for me and an opportunity came up at a great company in the industry. He could double his income, dream job. We went to him with it, he took it, and now we’re working with that company years later. So we’re just trying to have positive outcomes. We’re trying to remove the stigma around leaving. The data says if you look at Facebook and Google, the best places to work, that people last like 1.8 years. The data is pretty clear that people aren’t going to last forever. Rather than getting all upset when people want to leave, we’re trying to up the emotional intelligence, have people have open conversations, figure out good landing places, and we have a really great group of alumni that are advocates for us. Halelly: That’s really cool. Are you familiar with the book The Alliance? Bob: I think I’ve heard of it but I’m not familiar with it. Halelly: Reid Hoffman, LinkedIn founder, with Ben Casnocha and Chris Yeh. And they describe the employer relationship that they’re saying it’s changed. We need to just get with the program and talk about it more openly, and stop the charade of pretending that we’re back in the industrial age where you joined a company until you get the gold watch at the end of your whatever, 50 year career with them. It’s not going to happen, as you said, so why are we pretending that we’re going to stay together forever and how about if we just talk about it as, “Hey, we’re both on a temporary thing together.” Calling it a tour of duty, instead of employment, and the employer relationship is kind of like a project. We’re always just getting together. They might stick around for the next project and the next project with your company, or they might not. Being more honest about it just helps to free everybody else. We know the stigma exists because many cultures are not doing that, not being up front. Bob: To be fair, a lot of companies, I always say the employees really need to own it and have the discussion. A lot of reason why they don’t have discussions is because if they had that discussion at their company, the employer would tell them to leave. Halelly: Exactly, or they would retaliate against them or treat them differently for the time they’re still there. Bob: Yeah, and I think it’s such a shortsighted thing. Basically we spent two or three years, we built the system in our program around this. We started training. People started asking us, “How do you do this?” And I couldn’t really send them what we had. So my head of culture and myself sat down and, like I said, we’ve written an entire book on what is this, how do you do it? The real goal there is to break the two-weeks notice paradigm. We think this is, I agree with readers, it’s a relic from a different era. We want to see companies change their behaviors. When that comes out, I think it will give companies or people within organizations a playbook to say – it doesn’t have to be the whole company – but as a leader you could say, “This is how I’m going to run my team. I’m going to create honesty and transparency and my team, people on my team are going to go work at other places and I want to know about it.” We just had a whole discussion yesterday around someone was asking us about internal transfers and we’re like, “If you don’t let people even transfer internally, or you won’t have open discussions where they feel comfortable with you about that, then they’re just going to leave the company overall and not tell you.” We don’t really get two weeks notice from people. The problems that end up with these things turning negative or toxic are because people don’t address them or push them under the rug. I think we have this culture of, “Hey, what’s going on? There seems to be an issue here. Let’s talk about it.” And we have these frameworks, like I talked about before. We have decision trees. Is this a culture issue? Is this you’re looking to do something, you want to do something different – great. Do we have that role or do we not have that role? Okay, if we have that role or we’re going to have that role, here’s what we’ll do to move you into that role. If we don’t have that role, then we’re going to have an honest discussion and say, “You kind of identified you want to do something different. We don’t have that role. We should probably help you find that role somewhere else.” We really try to turn it into a science and give managers a playbook on how to work with it. Halelly: I love it. Because you’re right, when people feel like it’s going to be a career-hindering move to say what’s really going on, and they’re starting to lie and cheat, really they’re cheating on you when they’re looking for another job, and so your whole relationship changes to one of deceit. Bob: I’m a big fan of Dan Pink and the books he’s written, and his latest book When talks about timing. He talks about ending, and how the end changes your whole memory of the experience and why you should plan your best day of vacation the last day or two, because it will sort of burn the memory of your whole vacation. There are a lot of people who have done great work for a bunch of years and then how they leave will forever change that memory for the people that they worked around. So ending well is really important, and I think this whole two-weeks notice paradigm is not ending well. Let’s say we worked together for five years, you come to me and say, “I loved working for you but I’m leaving,” maybe it’s two weeks or three weeks or whatever, and then I start saying, “You never talked to me and oh, that doctor’s appointment, you were interviewing …” My whole memory of your time here changes. Halelly: Yes! Oh, listeners, if you remember, Dan Pink was on episode 83 and he talked about this book, When, so go check that out. This is so good and so important. Thank you for doing that kind of work, and also thank you for working out loud. In other words, you’re not just doing it on the inside of your company, but you’re sharing it with the world. That is really cool. We’re almost out of time. Before you share one specific action with listeners and we’ll talk about how to stay in touch with you, what’s new and exciting on your horizon? What project or discovery has your attention? Bob: Finishing my second book, so that’s got my attention. And we’re also expanding to Asia and I just launched an office in Singapore, so we’ve been ramping up our team over there. I’m headed over there in a few weeks and a lot of new experiences. We expanded into the UK last year, but Asia, just the time, the culture, it’s different. So it’s really interesting to try and build a company and take our culture and figure out how to globalize it and localize it. Halelly: This is so interesting. You know, Bob, I record my podcasts – a lot of times I batch them – so I was just recording an episode that probably will also come out before yours with a man who ran Saxo Bank for 20 years. He’s Danish, the Saxo Bank is a Danish company, but people work there from all over the world and we were talking about values and the ethnic culture and how to kind of merge the two or how to deal with that when your organization’s culture is maybe in some ways different than the local culture. Bob: I think I try to learn from other people’s failures, before I make them myself. Talking to a lot of companies that expanded, they seem to make one of two fatal flaws. One is they take, let’s pretend we’re going from the U.S. to the UK. They launch in London by taking all their U.S. teams and sending them over. They don’t understand the market, they don’t understand the differences, they know the company, but they kind of make a mess of the market. That’s one. Two is, they hire the local person out of the UK, leave them to run their stuff, don’t really explain the culture and it ends up being this siloed business that is almost a totally different business. So we’ve really worked hard, in talking to people, to cover the in between. We have a lot of talent going back and forth, learning from each other, really making sure that we respect those local differences and find people that are experts in the market, but understand we also have a single way of doing things as a company and we have cultural norms that need to be consistent throughout the organization. It’s been a challenge that I’ve actually enjoyed trying to make that work. Halelly: A very interesting challenge. Sounds exciting, and congratulations on your success. So Bob, what’s one specific action that our listeners can take today, this week, that can help them upgrade their own leadership skills? Bob: Read. I read a ton. We actually just bought Kindles for all of our executive leadership team and picked a book each quarter that we’re reading as a team. Whether it’s reading, podcasts, I just think there’s always opportunities to improve your intellectual capacity and get smarter and figure out how to do things in different ways and a lot of people have studied one aspect of something for 10 years and you can read that in a few hours and get the best of that. I’m a big fan of just reading and continuous learning. Halelly: Very cool. Do you have a particular philosophy about what you read or how you choose what to read? Bob: If I hear it two or three times, usually. So I look around my circles. I’m about 98-percent nonfiction in my reading. I like learning. I like pragmatic. For me, reading is sort of a learning thing rather than a distraction thing. But I look for what’s new, what’s coming out, things that help explain something a topic I’m interested in. Usually for me, I buy about 10 books for every two I read, and I read a lot. Everything interests me, but when I hear it the first time, and then I hear it the second time, by the time a third person in my network mentions a book to me, then I know it’s meant to be. Halelly: Gotcha. Very cool. Thank you for sharing that. Bob, how can people stay in touch, learn more from you and about you? Bob: Sure. Best way, you can go to RobertGlazer.com to find out everything about me. All the different links to the stuff I do. If you’re interested in joining the Friday Forward list and start getting a little note for yourself or to share with your team each Friday that’ll make you think, that’s at Fridayfwd.com. Halelly: Very good. Thank you for your time today. We appreciate that you came on the TalentGrow Show and shared your insights with the listeners. Halelly: There you have it. You need to keep learning. So listening to this podcast is a way that you’re doing that, so kudos to you. And are you a reader? Do you read? What are you reading? Share with us. Come on into the show notes page on TalentGrow.com and share in the comments any big takeaways that you’ve got from this episode and/or any books that you’d like to recommend to other listeners. We’d love to have a conversation and I’d love for you to also share your knowledge and your learning with us. Thanks for listening. I hope you enjoyed this episode. I am Halelly Azulay, your leadership development strategist here at TalentGrow and this has been the TalentGrow Show. Until the next time, make today great. Yes! Give me the free "10 Mistakes Leaders Make" tool! Don't forget to LEAVE A RATING/REVIEW ON APPLE PODCASTS/iTUNES! It’s easy to do (here’s how to do it in 4 easy steps). Thank you!! Like the Facebook page of The TalentGrow Show! Join the Facebook group – The TalentGrowers Community!